It’s that time of year again, Twin Cities geeks! After the huge success of last year’s Twin Cities Geek Holiday Toy & Book Drive, when we astoundingly collected over 500 donations of games, toys, books and other items, we are officially issuing a challenge to all geeks who live in and around the Twin Cities metro. This year, let’s not just double how much we can give for the holiday season—let’s triple it. That’s right! With your help, we are going to try to collect over 1,500 items to donate to two very worthy local organizations: The Hallie Q Brown Community Center in St. Paul, Minnesota, and the Women’s Prison Book Project in Minneapolis, Minnesota. 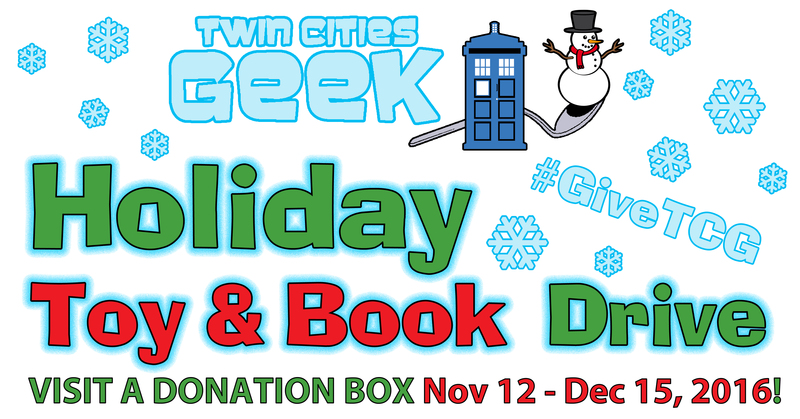 From November 12th through December 15th, please bring new and gently used toys and books to our 2016 Twin Cities Geek Holiday Toy & Book Drive donation box locations around the metro! Hallie Q. Brown Community Center is collecting new and gently used toys to distribute during the holidays to St. Paul families in need through Hallie’s Toy Shop. Something as simple as your old Charlie-in-the-Box can bring a smile to a young person. There is a great need for items that will appeal to teenagers, so please consider donating some cool stuff for teens! The Women’s Prison Book Project is collecting new and gently used paperback books of all kinds. The organization sends 3 paperback books per prisoner per month to cis and transgender women, and genderqueer persons in women’s prisons across the USA who write to request either specific titles or authors or just genres they enjoy. Geek-friendly businesses of the Twin Cities metro have really answered the call this year, and we have a grand total of 30 different locations hosting donation boxes for the 2016 Twin Cities Geek Holiday Toy & Book Drive, including gaming stores, toy stores, comic stores, music stores, art and craft supply stores, and even a store that sells fancy soda pop! Virtually all of them are locally-owned small businesses or community organizations, so pick the location most convenient for you to donate, and take some time to check out the spaces while you’re there—it’s a perfect opportunity learn more about your community, not to mention do your holiday shopping! Note: Open during all meetings and events on their calendar. If you can’t make it to a physical donation box, the Hallie Q Brown Community Center has provided us with an amazon wishlist. Click here to view it. Buy a gift and ship it straight there! You can also make monetary donations to the Hallie Q. Brown Community Center on their website, and to the Women’s Prison Book Project on their website, respectively. Here is some information about the two awesome organizations that the 2016 Twin Cities Geek Toy & Book Drive will benefit. Serving the Summit-University area of St. Paul, Minnesota, Hallie Q. Brown Community Center Inc. is a private, nonprofit social service agency what’s mission is to improve the quality of life in our community by providing access to critical human services, fostering and promoting personal growth, and developing community leadership. Although Hallie Q. Brown began as a settlement house for African Americans denied services from other agencies, they long ago opened the center’s services to all people. Historically, the Hallie Q. Brown service center has been mixed racially and economically. Approximately one-third of St. Paul’s people of color live in the Summit-University area and nearly 50 percent of the population are minority residents. The area continues to evolve demographically, and Hallie Q. Brown provides a wide range of services designed to reflect the character of the Summit-University community as a whole. The holiday toy drive is part of a larger Hallie Q. Brown effort to help meet the basic needs of St. Paul residents. Please check out more of the great work Hallie Q. Brown is doing at the center’s website, www.hallieqbrown.org. The Women’s Prison Book Project (WPBP) is currently located at Boneshaker Books in Seward. Since 1994, the WPBP has provided women and transgender persons in prison with free reading materials covering a wide range of topics, from law and education (dictionaries, GED, etc.) to fiction, politics, history, and women’s health. WPBP is an all-volunteer, grassroots organization that seeks to build connections with those behind the walls and to educate those of us on the outside about the realities of prison and the justice system. Of the more than 2 million people confined in US prisons and jails, over 150,000 are women. Eighty percent of these women are imprisoned for nonviolent crimes. Of the women convicted of violent crimes, the vast majority were convicted for defending themselves or their children from abuse. More than half of all women in prison are women of color, and two-thirds of women in prison have at least one child under age 18. Most of these mothers had primary custody of their children before going to prison. These facts mean that women in prison have specific needs for particular kinds of information: material on families, children, women’s self-help, women’s health, and legal aid pertaining to women who fight back against their abusers. Many lesbian, bisexual, and transgender prisoners have trouble obtaining information that is relevant to their lives. WPBP works to support prisoners and, through that solidarity, works to empower prisoners themselves and build connections through prison walls. Please check out more about the Women’s Prison Book Project at www.wpbp.org. So, tell your friends, stop by one of the donation-box locations, donate some toys and books, and post about your donations using #GiveTCG! Please thank the generous local businesses hosting donation boxes for us. Check out their stores, and support local business by doing some holiday shopping there. Together we can make others’ lives a little brighter this holiday season. Do you use Facebook? Click here for the Facebook event, and please invite your friends! Awesome! I definitely hope to contribute again this year!